Hard Water - What is it and why should I care? 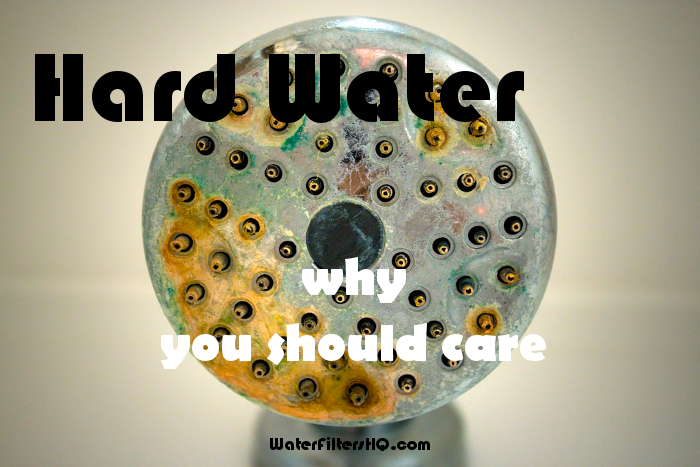 Hard Water - What is it and why should I care now? Do you constantly fight stains on fixtures and tiles? Then you probably suffer from so called hard water. While hard water in itself is no health risk, it can cause a wide variety of problems, ranging from aesthetic to expensive. What are some typical problems of hard water at home? What to do if you have hard water in your home? You call water "hard" when it is difficult to make a lather or suds for washing. The reason for this phenomenon is an abundant presence of mainly calcium and/or magnesium, two non-toxic minerals. The opposite, water with very little or no calcium and magnesium, is labeled "soft water". While calcium and magnesium are essential minerals for your body, hard water can cause a few problems around the house. These minerals can cause damage to appliances like your laundry machine, dish washer or water heater over time. If you use an electric kettle or a coffee machine, you may need to descale them more often. Because soap and other detergents perform poorly, you will need more of them. Not only is it an additional expense for you, but the environment also suffers when more detergents are released from your home. Stained fixtures - If you have white or light yellowish stains on your bathroom or kitchen fixtures, your water if probably too hard. You have white spots on tiles. When hard water evaporates, it leaves the calcium behind and white spots form where water drops hit the tiles. You can scrub them off, but they are a nuisance. You constantly need to remove soap scum from tiles and shower curtains. It doesn't look nice, and more importantly, if not removed regularly a - not so healthy - microbial bio film will grow. Your dishes have white spots. Calcium residue is left behind after drying. When you use soap, there is no or very little lather. Soaps contain a compounds that reduce surface tension to do their job. Minerals in water hinder the work of these compounds. Your shower heads and aerators clog over time. Lime scale build up and fewer water can pass through. Scale builds up in the commonly-used steel pipes. Over time this will reduce the diameter of the pipe and less water can pass. Additionally, unhealthy bacteria may grow inside your pipes and taps you do not use often. If you are lucky, your house has PVC or copper pipes. They don't accumulate hard water scale as easily as steel pipes. When you do laundry, you towels feel rough, your clothes look dingy and you need more detergent to get them clean. Your dishwasher or laundry machine need costly repairs earlier. When you heat up water, minerals cling to the heater element and sooner or later destroy it. The harder the water, the faster the build up of scale especially around the heating element. Other part of the machine will suffer as well, with the heating element being probably the first to give in. First of all, hard water is a solvable problem. If you own your house and have the budget, you may want to protect you whole house, dealing with the problem once and for all. Whole house water softeners are the best solution if you can afford it. If you rent or have limited funds to tackle this problem, do the math. How many appliances to you have that may get damaged over time? How much would you have to pay for repairs or earlier replacement? A portable water softener can protect at least your appliances. Hard water is a typical water issue that is best tackled with a whole-house system that can protect all pipes, plumbing fixtures and connected appliances. Costs for Point-of-entry water softeners vary, but expect at least $500. And if you can not do the installation yourself, you would also need the help of plumber. If you do not want to invest that much money, you should consider a smaller, mobile unit or a water conditioner. Portable water softeners, designed for use in RVs, boats or for mobile car washing services, are a cheaper alternative and ideal if you do not own the place where you live. The initial investment for a portable water softener is around $200. You install it at the tap that connects to your laundry machine or dishwasher. If you use a diverter, it would probably work to connect more that one appliance to one portable water softener. Installation is easy enough, so you don't need a plumber's help. Maybe an electronic or salt-free water softener is another option for you to consider. They do not remove the minerals that cause water hardness. Instead, they use electro-magnetic waves. This technique is less effective than salt-based softeners and doesn’t reduce the water hardness to less than 1 grain per gallon. It also takes longer before you notice the effect. On the other hand, such systems are a lot cheaper and nearly maintenance free.